You can catch Pokémon using a real-life Pokéball on Nintendo Switch and Pokémon GO! Alongside the announcement of Pokémon: Let’s Go for Nintendo Switch, the company unveiled a new controller that you can use instead of your Joy-Cons to catch ’em all. With the Poké Ball Plus, you can also use it to catch your favorite Pokémon GO characters similar to the way the wrist-worn Pokémon GO Plus works. If you’re wondering how it works, how much it costs, and when you can get one, you’re in the right place. What’s new with Poké Ball Plus? June 12, 2018: Exclusive Mythical Mew comes with Poké Ball Plus! Nintendo unveiled today a special bonus item that comes with your Poké Ball Plus: Mew! That’s right. Hidden inside the Nintendo Switch controller is the elusive, yet powerful Mew, which isn’t otherwise available in Pokémon Let’s Go at all! You’ll be able to transfer your Mew to your Nintendo Switch game — Pikuchu or Eevee — and add the special little Pokémon to your collection! The Poké Ball Plus is not just a great way to control and interact with Pokémon: Let’s Go, Pikachu! and Pokémon: Let’s Go, Eevee!—it also contains a very special bonus. Tucked away inside the Poké Ball Plus is the Mythical Pokémon Mew, and you’ll be able to bring it from there into your version of the new Nintendo Switch game where it can become a member of your team! How does Poké Ball Plus work with Nintendo Switch? It works like a Joy-Con controller. In Pokémon: Let’s Go, you’ll be able to throw Pokéballs in the game by flicking the Joy-Con or Poké Ball Plus. Catching a Pokémon in Let’s Go is similar to the way you’d catch one in Pokémon GO. The Poké Ball Plus controller has motion controls, vibration, sound, and colorful lights that will glow to show you the status of your catch. The latch on the front of the Poké Ball Plus is used as a navigation and movement joystick so you can walk around in the RPG part of the game. 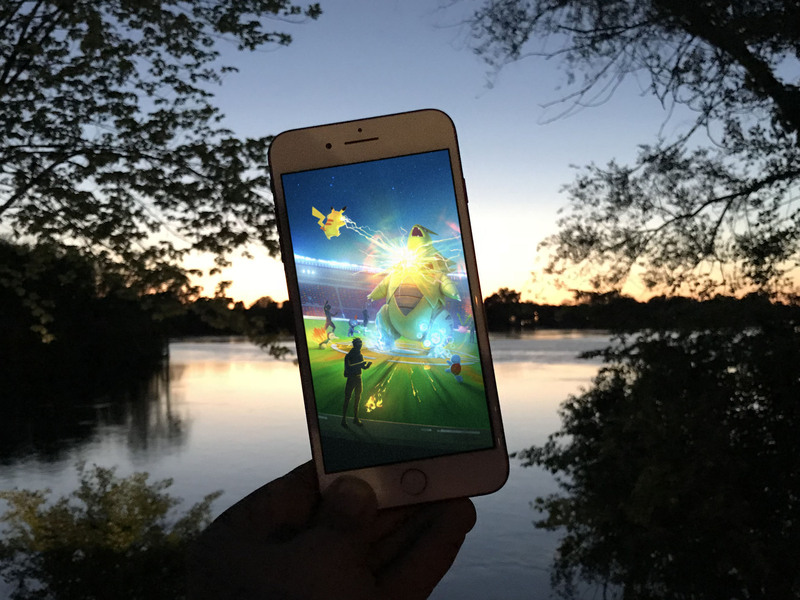 When you’re ready to catch a Pokémon, you can click the button on top to initiate the process. Then, flick the Poké Ball Plus to simulate throwing a Pokéball and watch as your favorite characters get added to your Pokédex. When you’re ready to battle another trainer, you can use the Poké Ball Plus to select and confirm your moves, too. How does Poké Ball Plus work with Pokémon GO on my phone? Poké Ball Plus works similar to the Pokémon GO Plus wrist-worn device does. When you’re out on a Poké walk, the Poké Ball Plus will light up and vibrate to let you know that a Pokémon is nearby. You can press the button on top to trigger the Pokéball throw. If you’re successful, the Poké Ball Plus will light up and vibrate to let you know. You can also use the Poké Ball Plus as a movement tracker to count your steps so you can hatch Eggs and get Candy. Can I use it with non-Pokémon games? Nope. Sorry. Nintendo clearly states on its Poké Ball Plus page that the controller is only compatible with Pokémon: Let’s Go on Switch or Pokémon GO on mobile devices at launch (maybe things will change after its initial release?). You heard correct. Pick a Pokémon in your game to transfer it to the Poké Ball Plus. Then, head out for a stroll. When you want to play with it, you can shake it, pet it, and listen for your Pokémon’s call! Nintendo neglected to mention the price of this little gem. If I were a guessing person, I’d wager it’ll be about $50. Considering the Pokémon GO Plus costs $35 and it doesn’t even work as a controller for Nintendo Switch, the Poké Ball Plus is probably not going to come cheap. It’ll launch along with Pokémon: Let’s Go on November 16, 2018. There currently isn’t any preorder information available, but we’ll be sure to update you as soon as we find out. You don’t want them to sell out before you get yours! Do you have any other questions about Poké Ball Plus? Put them in the comments and I’ll answer with any official information I get.